Robin Wright has a clear vision of the future of education. Understanding that future requires a look 6,000 years into the past, though. It requires an assessment of the technological wonders that have promised revolution over the years. It requires an understanding of literacy rates, which have reached 90 percent worldwide. It requires a look into the chemistry of the brain, which reacts to emotion and stress but also to action and interaction. It requires a look outward at the students in our classes. And perhaps most important, it requires a look inward at who we are and who we aspire to be. Robin Wright spoke about the human side of teaching and learning in her keynote address at Thursday’s Teaching Summit. Wright, a professor of biological sciences at the University of Minnesota, was the keynote speaker at KU’s annual Teaching Summit on Thursday. 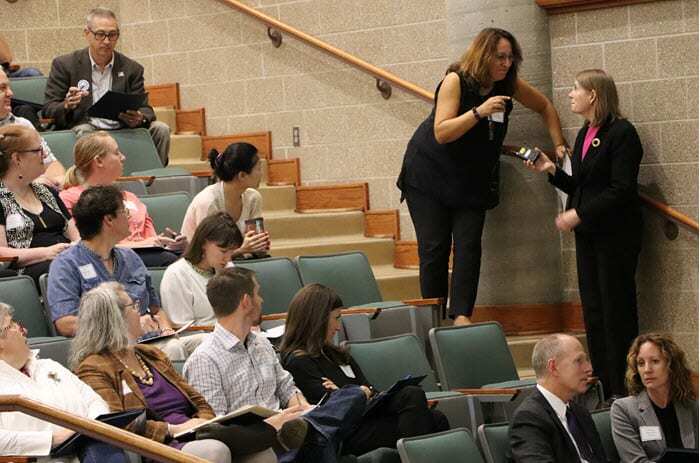 She shared with the summit’s 400 participants some of her research into active learning and student development, along with personal experiences in teaching undergraduate biology courses. Some of those experiences involved her own challenges as a teacher, including times when students simply weren’t understanding what she was teaching. You can only make memories by connecting them to older memories. People almost always learn better when they work together. Making memories requires repetition, feedback, elaboration and sleep. 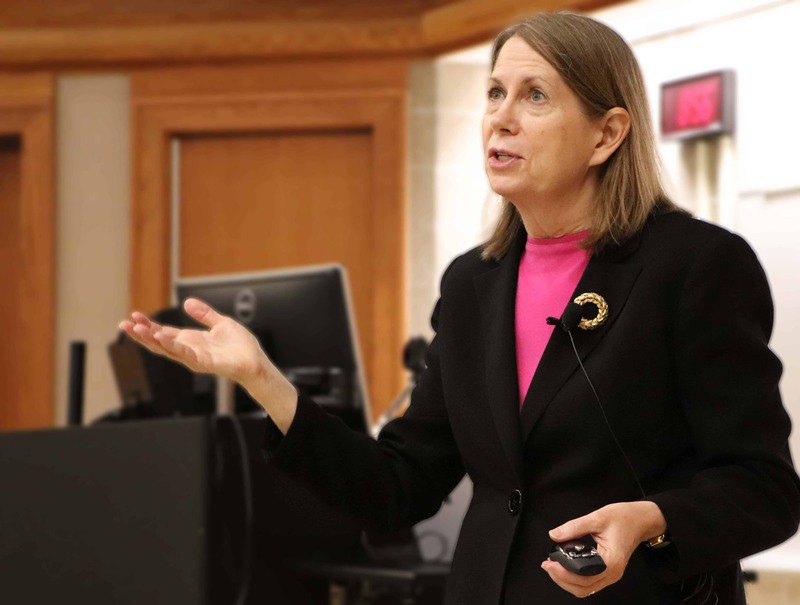 Until students do the hard work that learning requires, it doesn’t matter how many times instructors go over course material or how much effort they put into making classes active and engaging, Wright said. Mastery requires time and effort. Don’t get the wrong idea from that. What instructors do has an enormous impact. Teaching and learning require concerted efforts by both students and instructors. That effort works best with human interaction, though. That was the message that Wright delivered again and again: that in a technology-fueled world, the human elements of education are more important than ever. “The most important way we can be human is to teach,” Wright said. Wright’s keynote address and workshops she led later in the morning tied into the summit’s theme, Teaching the Whole Student. That theme evolved from recent research suggesting that a holistic approach to education helps students succeed. We can’t just teach content. Nor can we throw students into that content and expect them to learn on their own. Rather, instructors and universities must engage students in education and help them gain a sense of belonging; support them in their educational endeavors and help them overcome barriers; and provide mentoring from staff members, faculty members and students’ peers. Wright takes a question from Candan Tamerler, professor of mechanical engineering. After the summit, Wright said that her message would not have been well received just a few years ago. Even now, critics berate universities for coddling students and encouraging hypersensitivity rather than pushing them to harden themselves for an unforgiving world. Wright steered clear of the political hyperbole, grounding her arguments in science, history, and the scholarship of teaching and learning. Even so, she acknowledged her role as provocateur as she made a case for what education is and what it could be. Naysayers have tried to displace in-person education for centuries, she said. The first known correspondence course – one for shorthand – was offered in 1728. In 1906, a correspondence degree program in Pennsylvania attracted a million people but had a graduation rate of 2.6 percent, about the same as today’s massive open online courses. Thomas Edison promoted the phonograph as a great educational tool. Broadcasters did the same with radio and then television. MOOC creators promised a revolution – one that fizzled before it barely started. Despite all these other opportunities and all the new technological tools that have emerged, we still have in-person education. Furthermore, Wright said, 90 percent of the world’s population can read and write. More and more of that population has access to the Internet and its vast universe of information, meaning that people can learn just about anything and anywhere on their own. And yet year after year, students and instructors still gather in classrooms to learn. Why? she asked, quickly providing her own answer: Because the way we learn hasn’t changed since the days when people gathered around campfires, shared stories, and helped each other understand the world. Wright explained the importance of brain chemistry and the role that stress, emotion, and sleep play in our ability to learn. She touched on social theory as a means of explaining learning, and the way that such factors as pedagogy, classroom climate, focus, motivation and metacognition influence individual performance. Our growing understanding of those factors continues to improve teaching. That is, the same strategy doesn’t work for everyone. “People look at things in different ways because their brains are different,” Wright said. That’s where the human aspects of teaching must take over. “We have to consider the whole person as a living, breathing, complicated, annoying, wonderful human being,” Wright said. To emphasize that, Wright told of a high school teacher who once told her she was a good writer. Decades later, Wright still remembers that praise fondly, and she urged attendees to make the most of human interaction with their students. “If you can do one thing to improve the effectiveness of your teaching and your learning, it’s to give people a chance to interact,” Wright said. Adding a human touch to education also helps shape the future, she said. “Being able to put your arm around a student and say, ‘You are really, really good at biology. I think you could have a career in it.’ That has enormous, enormous impact,” Wright said. That doesn’t mean we should shy away from technology. Not at all. We should use it to its full potential to personalize teaching and learning, she said. In the end, though, the future of education lies in its humanity. “There’s power in you as a living human being interacting with other human beings,” Wright said. That power has kept education alive for millennia. And if Wright’s vision is correct, it will propel higher education into the future. Tagged a, active learning, future of higher education, KU Teaching Summit.